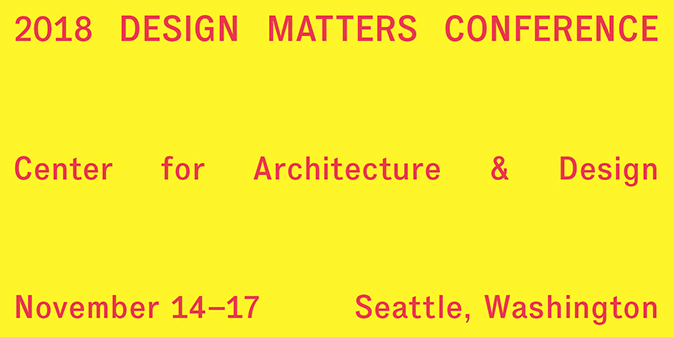 A big thank you to everyone who attended the 2018 DESIGN MATTERS CONFERENCE in Seattle. This year’s meeting—our first on the West Coast—attracted 117 attendees, hailing from 29 U.S. cities and 6 countries. In what turned out to be a great display of young talent from across the AAO Network, more than half our conference presenters were younger than 40 years old—and all of them doing extraordinary work. We investigated the latest experiments in conceiving architecture and design-related festivals, exhibits, lectures, research, and educational activities. The breadth of approaches was energizing to see and it was clear that tackling equity issues requires extra ingenuity from design organizations and a willingness to take risks and learn. Our speakers brought that last notion to the fore time and again, including a terrific opening address from Seattle Mayor Jenny Durkan. 1. AAO Members made it clear that finding opportunities to work together should be a priority moving forward. As one response, this winter AAO will be establishing a member-led committee devoted to highlighting and workshopping exhibitions fit for travel across the AAO Network. 2. AAO Members made it clear that career development for younger workers in our field must also become a top priority. One active response from the AAO Board of Directors will be issuing invitations to select grant makers to investigate this topic with us and build up their awareness of the positive contributions our field makes to city building. Of course, we would be remiss if we did not take a moment to recognize our sponsors and local hosts, whose financial support and patient advice brought us many benefits, including steering us to the wonderful venues that hosted our different conference days. On behalf of our Board and all the attendees of our conference, thank you very much. Finally, let me be the first to encourage you to join us in Chicago next November 7-9 for the Design Matters Conference 2019 edition. Mark your calendars now!